Before we dive into the review of the Leica DISTO E7400x Laser Distance Meter, let us tackle first what is a Laser Distance Meter. Diving into a little history lesson, did you know that it was in 1993 when Leica Geosystem introduced the first ever Laser Distance Meter or LDM in Paris? Just like what cellphones back then looks like, the first ever Laser Distance Meter that Leica introduced had the size and weight that was similar to a brick. Can you imagine how much effort people have to spend just to lift and operate this device back then? According to Leica, the first ever Leica DISTO weighed almost 2 pounds with the capacity to measure up to 100 inches in fine conditions and was accurate to 1/8 inches. When it comes to operation, the Leica DISTO has a very simple operation since you just have to turn it ON, point it to your target, press a button, and you will get the accurate distance of the laser in an instant by reading what’s on the screen. But do you have any idea what this kind of device can really do? A Laser Distance Meter is a special device that measures the exact time a pulse of laser light will be projected to its target and returned to its sender. As a principle, this is called the “time of flight”, and as a method, this is called the “pulse” measurement or “time of flight”. This principle came from the fact that a laser light has the ability to travel at a great speed through the atmosphere. Thus, the job of this metering device is to calculate the laser’s distance to the target. Now that we are done with the trivia and short history lesson about Leica’s Laser Distance Meter, let’s get a close look at Leica DISTO E7400x Laser Distance Meter. Coming from a well-known and reliable brand, there is no doubt that Leica DISTO E7400x Laser Distance Meter is currently one of the most popular devices on the market. As a matter of fact, spending some of your time to read through this post will help you save a lot of time and money on getting the best laser distance Measurer. Leica DISTO E7400x Meter has the ability to measure up to 265 feet with impressive 1/16 inches accuracy. Leica DISTO Meter uses a Class II laser with a 1mW output. This portable device can calculate horizontal distances despite all the obstructions, area, and volume. It doesn’t matter as well since Leica DISTO E7400x Laser Distance Meter has a tilt sensor. Just imagine how much work you can do with a device that has a long-range measuring distance of up to 265 feet. But that is not all since Leica DISTO E7400x can still be extended up to 325 feet with the aid of a reflective target. No matter what is the light condition inside the room, you will still be able to see the laser dot of Leica DISTO E7400x in a great distance with its impressive accuracy. Moreover, this model from Leica is compliant with the international standards for Laser Distance Meter – ISO Standard 16331-1. With brighter, bigger, and bolder screen display, Leica DISTO E7400x has truly evolved a lot over the years. In fact, the brand of Leica Geosystems is one of the top manufacturers that use an advanced technology to produce high-tech devices. As a result, this Laser Distance Meter model from Leica has better visibility compared with other devices. Whether you are using it in full sun or in total darkness, every detail on the screen can be seen in crystal clear. If you think that your Laser Distance Meter is strong enough to withstand various elements, wait until you put it into action. 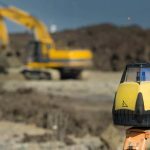 As expected in a high-end device that is built with highly sensitive measurement elements, Leica made sure that Leica DISTO E7400x will be able to withstand various working conditions. This includes the usual knocks, spills, and dust that the device may face in the working environment. This is because Leica DISTO E7400x has a ruggedized IP65 certified water jet protection and a dust-tight casing which provides superior protection to the device. Once you notice some dirt on the device, you can just wipe it off easily with a damp cloth and move on. If you are having a hard time getting measurements in hard to reach areas, you are not alone. But with Leica DISTO E7400x, you can finally continue with your work using its 360° tilt sensor feature. This is the answer to measuring hard to reach areas since you can instantly get the precise measurement of things based on your distance and angle without leaving your safe zone. You can also use its standard ¼ -20 tripod thread to get better results. Just aim the device, turn it ON, tilt it, and let Leica DISTO E7400x to its magic. Its intelligent end piece can detect its orientation and automatically adjust the 0 point accordingly. By default, Leica DISTO E7400x can store up to 20 measurements by pressing the key units and navigating to its last reading with the “+” or “-“key. Overall, Leica DISTO E7400x Laser Distance Meter is indeed a handy device for people who rely on exact measurements especially those professionals who need to get the measurement of things within dangerous areas. A Laser Distance Meter helps a lot in transforming complicated jobs into simpler jobs in just seconds. Most importantly, it is user-friendly and very accessible. Click here to check out our different laser level models with reviews and indepth buying guide. 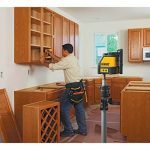 How to Install Cabinets with a Laser Level?